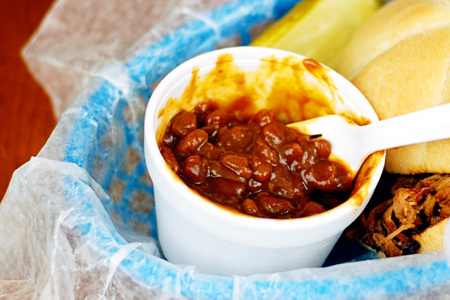 One of the required sides for a traditional barbecue meal is beans. I occasionally cook for groups, and these are what I've been serving lately. They are simple and easy to make, but they pack huge flavor. They're thick and rich with a great balance of sweet, savory, and tangy. Another great thing about these beans is that they are a great base for adding all manner of other delicious ingredients. You could add peppers, bacon, diced ham, pulled pork, chopped brisket, or anything else you think belongs in good beans. Doctor 'em up and make them your own! 2 medium Yellow onions, diced to 1/4"
Add the bacon fat/oil and let heat 30 seconds. Add the onions and cook until they are translucent and just barely starting to brown on the edges. Add all of the other ingredients, except the beans, to the pan and stir to mix well. Add the beans (do not drain them) to a large deep baking dish. Note: I use disposable aluminum lasagna pans. Add the onion and sauce mixture to the beans, and stir to combine well. Cover the pan with foil and bake for 90 minutes. Remove the foil, stir, and bake another 30 minutes. Tip: Of course you can cook these uncovered on your smoker to really take them over the top. You'll probably need to add a little water toward the end to loosen them up. I just posted a dutch oven recipe for Beer/Molasses baked beans. Your look great, and I will try them, but done in the old black pot. I use 1/4 cup of molasses and use 1/4 cup of honey and add 2 Tbs of chili powder. Use more brown sugar f not sweet enough for me. Top off with fresh cracked black pepper right before serving. I made these for the family yesterday and they liked them quite a bit! I smoked them on my drum at 250-275° with hickory for about three hours, stirring occasionally... good stuff! About how many does this recipe serve? I need a good bean recipe that will serve 30-40 people. These look very tasty. I have never seen Original Ranch Style Beans, however. Are those Bush's brand too? Anonymous - The recipe makes about 28 six ounce (3/4 cup) servings. I've amended the recipe to indicate that. As for the beans, no the Original Ranch Style beans aren't Bush's, but Bush's Texas Ranchero Grillin' Beans would be a great substitution. Great recipe! I had to use a 2nd half pan and fill the two pan up to the same depth as it wouldn't all go in one pan. Chet - I'm glad that it worked well for you.